The only “outdated” and “dangerous” aspect of a slushy slip and slide event held by engineering students at Ryerson University is the response it generated from Big Mother, Ontario Premier Kathleen Wynne. Reporter: “There was a hazing video that surfaced over the weekend at Ryerson, or steps away from a Ryerson facility. Are you concerned that something like this is happening in Ontario? Wynne: “Whenever I hear these stories about hazing or initiation rituals I am very concerned. I think they’re outdated, I think they’re, ah, um, dangerous, and I think that we have to do everything to make sure that, uh, all of our students – in whatever institution – are safe”. If Ms Wynne did not know anything about the Ryerson event itself – as it appears was the case – and just gave a canned answer, that was unprofessional and careless. If, in contrast, she had knowledge of the event when she felt so comfortable condemning it, that is quite a bit worse. It is both a show of gross ignorance about the nature and value of such events, and a demonstration of the fact that the replacement of Dalton McGuinty by Kathleen Wynne is really just a replacement of “Premier Dad” with “Big Mother”: a confusion of governance with parenting. Not all “initiation rituals” amount to “hazing”. The word “hazing” not only connotes, but denotes, conduct in which a student’s life, liberty, or property are taken without their consent or contrary to civil or criminal law. Examples might include being abducted from one’s dorm room against ones will, being forcibly confined, being paddled, and the like. However, many initiation rituals do not violate the law, and are consensual. They involve no criminal conduct, no civil wrong, and no coercion. When an initiation ritual neither violates the law, nor involves the taking of a person’s life, liberty, or property without their consent, one is not speaking of an instance of “hazing”. The slushy slide at Ryerson was not an instance of hazing, and to characterize it as such not only insults the participants, but minimizes the plight of those who truly are the victims of hazing. Both political party leaders appear not only to have condemned wrongfully a non-hazing event as a though it were a hazing, but also to be entirely ignorant of the purpose and effect of initiation rituals that are not hazings. Engineering students – not only at Ryerson, but at every university – are a bit of a special breed. They tend to have the highest highschool grades in the “tough” subjects: math, biology, chemistry, and physics. Competition to get into an engineering program can be fierce relative to the competition to get into, say, a general arts or science program (so that no one might accuse me of somehow being biased toward engineering degrees: for the record, I graduated proudly with an Honours Bachelor of Science degree, not with an engineering degree). Accordingly, students admitted to engineering programs have every right to crow about their academic accomplishment, and are justified should they feel and express pride in what they have and will accomplish. I do not claim a knowledge of anything akin to a complete list of initiation rituals that occur in Ontario’s universities. However, I offer up one example of a non-hazing initiation ritual – which I learned about as early as my highschool days (as late as 1985) – that continues to this day and that demonstrates the wrongfulness of throwing the baby out with the bathwater when it comes to university rituals. Engineering students at Queen’s are enrolled under the Faculty of Engineering & Applied Science. Engineering student spirit is very evident through strong traditions. One such tradition is the dyeing of themselves and their golden leather jackets (known as “Golden Party Armour” or GPA for short) purple with gentian violet (“purpling” is the verb used to describe this). The full-body purpling is mostly done only by second-year students who are involved in frosh week facilitation, called “FRECs”, an acronym derived from “Frosh Regulation Enforcement Committee ,” although the original term remains only as a historical note. 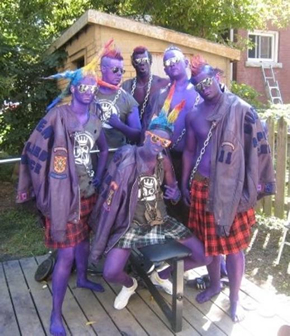 As a result of the ban on “purple people” in residences and cafeterias made in 1990 (due to the colour rubbing off), most first-year students don’t purple during frosh week, as the majority live in residence. However, frosh are known to purple themselves during homecoming weekend on the Saturday morning preceding the football game. The purpling of jackets by frosh is considered a rite of passage, performed two nights before their final exam of the fall term, immediately after getting their jackets and kicking them home. The jackets are literally kicked back to their residences or homes, as frosh cannot touch the jackets with their hands until they have been brought home. This has stemmed the tradition of upper years playing pranks on frosh, (e.g. throwing the jackets on roofs, tying them to a pole, etc., and having the frosh find ways to get back their jackets without using hands). The right to wear the jacket is not permitted until the final fall term exam has been completed. In addition, badges and crests, in particular the “Pass Crest” that goes on the sleeve, may not be added to the jacket until the completion of First Year exams. After the completion of First Year, in April, students may also sew on various “bars” to their jackets. Bars are earned and ordered for a variety of events and feats. There are many bars for accomplishments, for participating in activities, such as Thundersledz (a winter frosh group event), for signifying the countries they have the most affinity with, signifying the discipline they are in, etc. Yes, they are stained. Yes, they get dirty. Yes, they shed a bit of clothing and don their skins…which is not to imply that they get naked. Are they thereby belittled, bullied, or harmed? No, far from it. To the contrary, their purple stain is worn with pride, and there are reportedly few among the Queen’s student body who do not look upon their purpled, greasy engineers with admiration. The engineering students at Ryerson, no doubt, felt the same pride when they braved the cold and crawled their way to the other end of a slushy ice rink. They did not only what others were too timid to do, but what non-engineers were not invited to do: to be part of Ryerson’s proud bunch of intellectual bright sparks; the inventors, the problem solvers, the people who make the as-yet-never-done the doable and the routine; the engineers. To condemn this event as “hazing” was not simply knee-jerk and politically correct. It was a disservice to one of Ontario’s hardest-working group of intellectuals. It was an unjustified attempt to place a black-mark on what remains – despite Ms Wynne’s and Ms Horwath’s electorally-motivated utterances – a fun and unforgettable memory. My only advice to the unjustly maligned engineering students of Ryerson is this: ignore the politicians. Rejoice in your excellence. Remember fondly everything you and your fellow engineers did in celebration of your academic achievement. My advice to Ontario students as a whole is this: again, ignore the politicians. If you have the opportunity to involve yourself in an initiation ritual, decide whether or not it is a safe and legal activity, and take responsibility for your decision to participate in it, or to refrain from participating. Taking responsibility for your decision will be your most important achievement at university: it will represent your passage from childhood into adulthood. To you sir I give my thanks. We have been given an incredibly hard time over an event that I personally deem there to be nothing wrong with. I myself have put in an entire weekend of PR work explaining to everybody exactly what you have summed up here in this article. I will be linking this article to various forums. But before I started that I wanted to give you a sincere and heartfelt thank you. In a situation such as this it is easy not to care, but you have gone above and beyond what was necessary for a Student Group that you aren’t a part of. You are welcome to come and visit us at Ryerson any time. Swing by the RESS office and you will receive a warm welcome. Thank-you Nathan. Best to you and all at Ryerson. Thanks Paul, well-said. Trying to explain engineering traditions to outraged people who don’t take a minute to a) ask a participant what was going on and why b) put the events on youtube in context was proving very difficult.